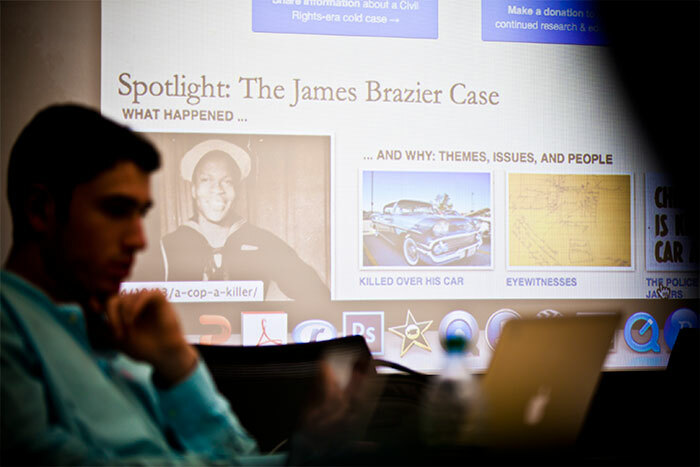 Students in the fall 2014 course on the Georgia Civil Rights Cold Cases Project discuss the case of the Rev. Clarence H. Pickett, who was killed in 1957. The Georgia Civil Rights Cold Cases Project website is the product of more than 50 undergraduates' work through an Emory course taught by Hank Klibanoff and Brett Gadsden. 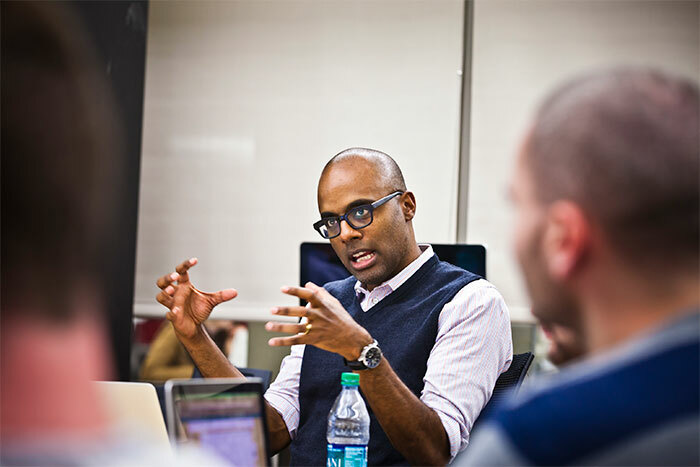 Brett Gadsden, associate professor of history and African American studies, says students working on the project discover they are accountable to a larger audience. Hank Klibanoff, James M. Cox Jr. Professor of Journalism, says the project helps students "discover what it takes to reveal the truth." A new website by the Georgia Civil Rights Cold Cases Project at Emory uncovers the history of racially motivated murders in the Jim Crow South. All photos by Emory Photo/Video. A new website by the Georgia Civil Rights Cold Cases Project (coldcases.emory.edu) at Emory University is bringing together years of research, discovery and writing by Emory undergraduates about the history of Jim Crow and violence. And some families are seeing brought to light for the first time the circumstances surrounding the deaths of their loved ones. 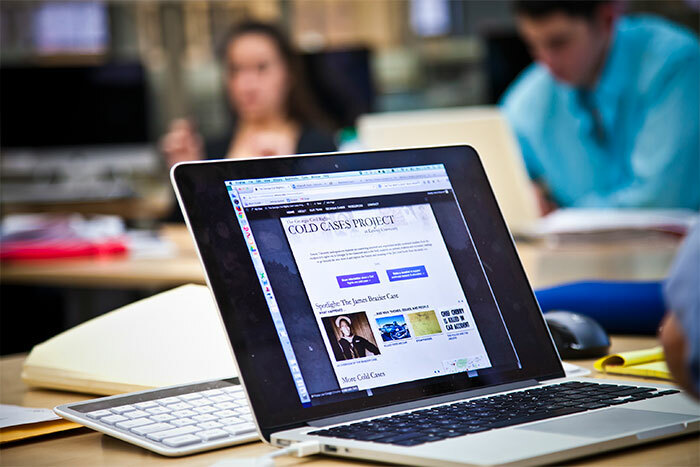 The site is the product of more than 50 undergraduates' work through an Emory course that has been taught nearly every semester since 2011 by Pulitzer Prize winning journalist Hank Klibanoff, James M. Cox Jr. Professor of Journalism, and Brett Gadsden, associate professor of history and African American studies. Together Klibanoff and Gadsden have challenged students to uncover Georgia history through the prism of unsolved or unpunished racially motivated murders in the Jim Crow South — and the students have made some remarkable finds. For example, the cold cases site highlights the death of James Brazier, an African American resident of Terrell County, Georgia, who worked three jobs including at a Chevrolet dealership and who drove a late-model Chevy. Brazier, jailed in 1958 after coming to his father's aid during a traffic stop by police, was released to his wife a day later with injuries so severe he died within days. Brazier, whose ownership of late model cars triggered explicit objections from white police officers, was making more money at his three jobs than the officers who arrested him. Doctors misdiagnosed Brazier's jailhouse injuries. (Students have unearthed similar misdiagnoses in other cases.) Doctors noted bleeding from Brazier's nose and ear and slurred speech, but chose to diagnose him as drunk rather than brain-injured. A key eyewitness in the case whose name had been redacted—from all but one page of the FBI files—was discovered by students and interviewed by Klibanoff, Gadsden and then-student Mary Claire Kelly. The eyewitness acknowledged she did not tell the truth at an important trial for fear that police would retaliate. "This course is not just a who-done-it. We're not just out to find out who killed James Brazier, because in fact, we know," says Klibanoff, who serves as director of the project. "It's to teach the history of the times, to help students discover what it takes to reveal the truth, to close gaps in history, and in some cases, to bring closure to families of victims." Erica Sterling, a senior history and psychology major who took the course in spring 2014, has continued to work on the project. "I learned that justice can take several forms," she says. "It's not justice in the traditional sense, but it's still justice, in that there's an acknowledgement that something happened that shouldn't have happened. We're intervening to give these people a hearing that they wouldn't have gotten 60 years ago." Gadsden also notes the effect of the course on students. 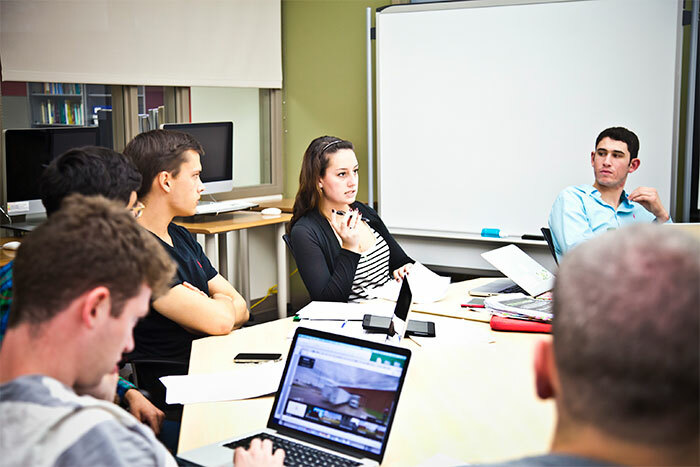 "One of the great things about the course is that students get a sense of the broader responsibility they have. In the course of their research and writing, they discover they are accountable to a much larger audience." For Nathaniel Meyersohn, a senior history major who took the course in the fall of 2013, participating in the project was an unforgettable experience. "It's the class that I'll remember most at Emory," he says. "In what other class can you write using primary sources combined with secondary material to create something lasting?" The Georgia Civil Rights Cold Cases Project at Emory is one of several initiatives around the country founded in the past decade that shines a spotlight on mid-20th century race relations and on African Americans who were killed because of their race. Why would white police officers be so offended that a black man owned a nicer car than they could afford that the officers would kill the black man? Why would white physicians, examining black patients who had been brutally beaten by police, so readily conclude the victims were drunk or faking pain and ignore the signs of grave injury, withhold medical treatment, and send the patients home or back to their jail cells to die? "In this course, students hold in their hands true life examples of law enforcement brutality, medical neglect, judicial unfairness, journalistic abuse and political provocation that were constantly inflicted across racial lines for the most inhumane and irrational reasons," says Klibanoff. "Once students get past their visceral outrage or sympathy, they begin to see that there are larger forces at work, and become sophisticated analysts of the period." Adds Gadsden, "One of the things that Hank and I demand of students is rigor and precision in language and analysis. Those are skills that have universal application and will empower students as they pursue careers in journalism, academe or beyond." 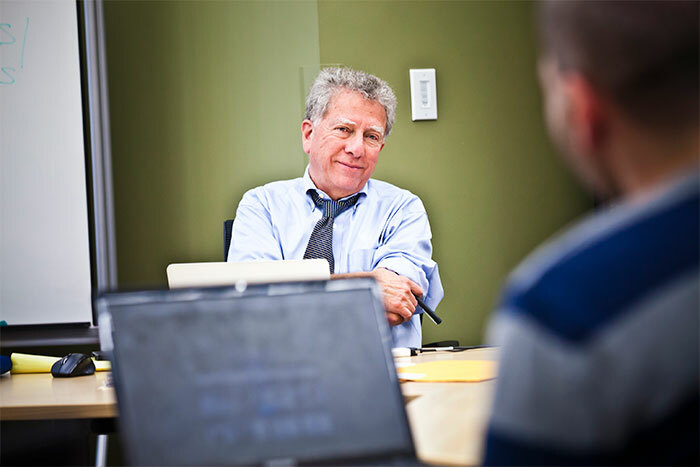 The website was designed and developed by Emory's Center for Digital Scholarship (ECDS), and is one of several publication projects ECDS has been able to launch with support from the Andrew W. Mellon Foundation, says Allen Tullos, Emory professor of history and EDCS co-director. Klibanoff and Gadsden also have received grants from Emory's Center for Faculty Development and Excellence to support research trips inside Georgia, to purchase documents and photographs, and to hire a professional editor. "The project is organic," says Klibanoff. "We have student papers on two cases that are being edited now for the website, and we are assigning new cases we are only now learning about." And because students are able to build on their predecessors' work, their findings and essays "speak to each other in new ways," says Gadsden. "We've been able to create a community of scholars." The project explores the past, but also influences the present, says Tullos. "This is a project that helps restore the biographies of people and the history of places so that you get a stronger sense of the realities of Jim Crow society," he explains. "The fact that undergraduates are participating is something they can be really proud of and can use these skills to carry on future research."